A jump starter, also known as a boost, is basically a way of starting a vehicle with a low external power source to the dead battery. It is a power source for 12V DC accessories that have a 12V plug to connect. 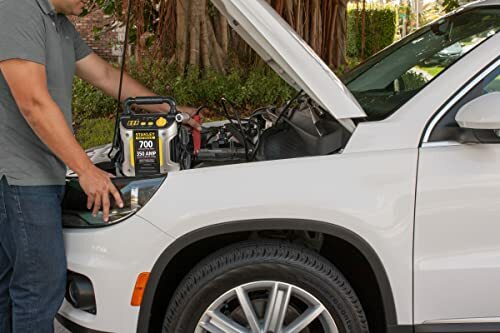 The special features of this jump starter are listed below. Has a heavy duty, very durable battery. The automatic built-in charger of 3 amps. It is compatible with big truck batteries for heavy engines. Portable with appropriate dimensions to carry around. Unique and powerful technical specifications make it compatible with almost all engines. It’s capable of jump-starting trucks with multiple batteries, farm tractors, and even big generators. 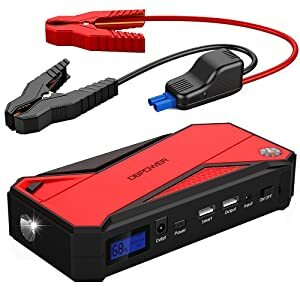 Flexible and portable — Its small size gives you the ideal device as it will fit in a space where another vehicle would not fit making it the best jump starter among others. Built-in automatic and flexible charger — This 3-amp charger with 2-gauge 55’’ long cables makes the task more flexible. It also makes easier to jump-start bigger engines. Stops charging automatically — The model is capable of stopping the charging process entirely on its own. This means it won’t drain due to overcharging if left to charge over unlimited time. No extension cable for charging the battery itself. 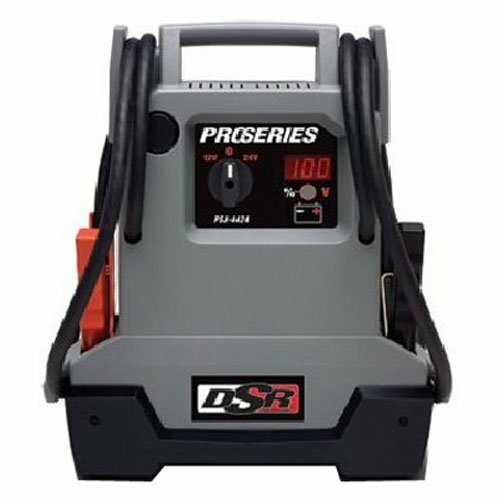 The Schumacher PSJ-4424 DSR Jump Starter is built for tailgating and camping lovers. Furthermore, it is also built to mitigate the effects of power outages this means you will never be stranded without power with the best jump starter like the Schumacher PSJ-4424 DSR jump starter. This model is capable of switching from 12 to 24V with the turn of a single knob. All this is done without compromising on its power. 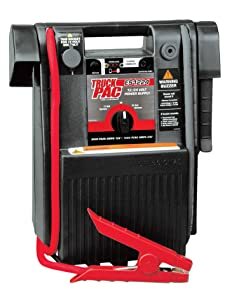 The Truck PAC ES1224 is versatile and easy to use design. It has 3,000 peak amps for 12V and 1,500 peak amps for 24V. Can switch from 12V to 24V with a turn of a knob. Impact resistant and shock absorbing casing. Automatic recharge — It comes with an AC wall charger that can be left to charge over a period of time. Hence, this ensures that the jump starter is always ready for use when the need arises. Extra flexible cables– Truck PAC ES1224 model features long 60’’ cables to enable the strategic positioning of your device. What this means is that your jump starter does not hang in the air when starting. Withstands harsh temperatures — This device will operate in temperatures as low as -20˚F and as high as 115˚F. In addition, Flexible and durable — Its ability to switch from 12V to 24V without tampering with its power shows its flexibility and great strength. This device will operate in temperatures as low as -20˚F and as high as 115˚F. Aside from its impact resistant casing, some parts have been said to break easily e.g. its clamps. This model is specifically built with vehicle jump starting in mind. Therefore, able to withstand professional use over a repeated duration of time. The model is, therefore, overall suited for individual and professional use meaning it can be used in the shop, on a construction site or in a garage for fleet maintenance. Moreover, it is recommended for companies with large fleets due to its compatibility with a wide range of engines. 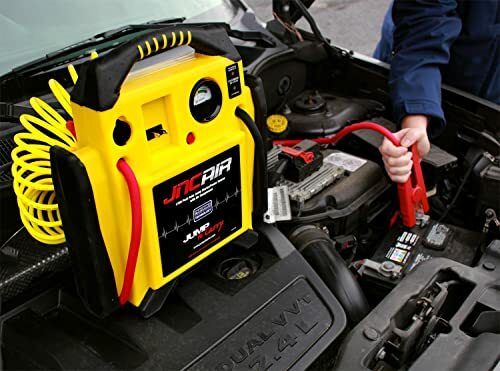 Jump-N-Carry-JNCAIR JumpStarter takes multipurpose professional jump starting to new heights. Designed with Clore Proformer technology for its battery. Delivers peak amps of 1,700 and cranking amps 425. Moreover, it also comes with 68’’ long cables. A DC outlet 12 V is also available to power accessories. Has a longer cranking duration. It features a long service life. Built-in air compressor — Its integrated air compressor makes this model enviable among its kind. Combining shop convenience in a portable device, it can inflate a 15’’ tire from scratch in less than seven minutes. Automatic built-in recharge — This is made possible by its inbuilt AC charger to ensure your device is always operational. On top of that, it features an efficient charging routine that stops charging once the battery is fully charged. Strong rubber boot — A top-notch rubber boot provides extra strength that allows you to place your device anywhere you need. Optimum power — Power is the key feature in this device. Then, with its Clore Proformer battery, it is designed to offer highly reliable power and a service life that is longer. Cables and air rubber hose may easily degrade if not well maintained. 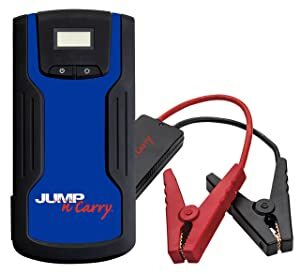 The Jump-N-Carry-JNCAIR JumpStarter also takes multipurpose jump starting to a new height. Besides, it is a convenient and powerful tool for both individual car owners and professionals in the workshop for fleet maintenance. 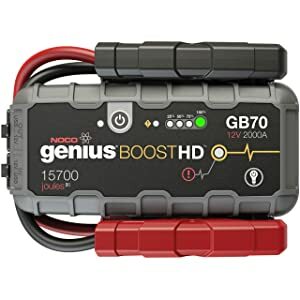 The GB70 jump starter is both a compact and powerful device, being powered by a sleek lithium-ion battery pack and used for 12V batteries. 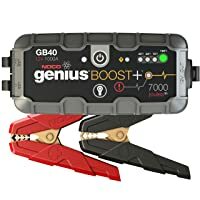 With this device, you can safely and easily jump start a flat battery in a matter of seconds. 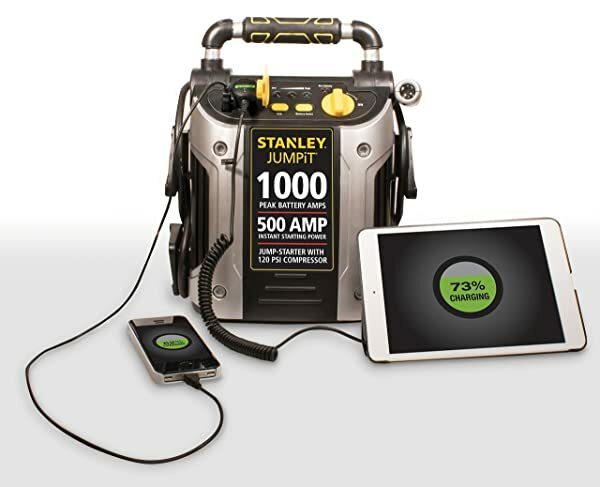 A single charge to this device will provide up to 40 times jump starts. It’s built with spark-proof technology making it mistake proof and it also has protection from reverse polarity. Furthermore, it is compatible with gas engines of up to 8,000cc and diesel engines of up to 6,000cc. The extreme safety feature of spark-proof technology. It features reverse-polarity protection capabilities. Can hold its charge for up to 12 months. Extremely bright flashlight — This is featured in a 400 lumen bright 8 LED flashlight. 12V USB output — This comes in handy when powering other accessories like tire pumps and inverters. It can also charge any other personal device like your tablet or smartphone. Extra variety of functions e.g. charging and inflating tires. It is not efficient with big machines. Basically compatible with small engines and average family cars. No wall adapter for reliable and fast charging. This product is most recommended for individuals especially with average family cars. Its several features make it suitable for outdoor activities like tailgating and camping. 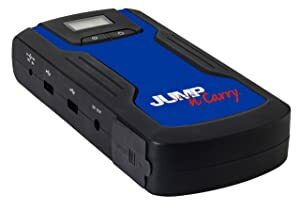 The Jump-N-Carry-JNC660 is not only known for its unmatched power reliability but also it comes with a peak Amp of 1,700 and cranking Amp of 425. Its battery technology is Clore Performer. Aside from that, it comes with 46’’ long welding cables and hot jaw clamps. Onboard voltmeter to provide battery charge status. Has a DC input to recharge its internal battery and 12V output to power your accessories. High-performance battery with extended cranking power. Reliable power output — The batteries are built with Clore Proformer technology specifically designed for jump-starting functions. It is therefore capable of delivering excellent cranking power, a longer cranking duration and several jumps per charge. Executive performance — With its wide array of features, it makes jump starting highly efficient and convenient. With a 46’’ long cables that ensure you reach the starting points of various vehicles. Durable casing — Its heavy duty carrying case is designed to withstand everyday shocks in the everyday professional field. In-built voltmeter — Its built-in voltmeter with a display on the side of the device helps to check on your battery status. 12V output power supply — This can be used to power a number of accessories. Also, included is an automatic circuit protection against power overloads. In-built charger — Has a fully automatic charge system that enables your device to be on standby for use whenever needed. It is not reliable for bigger vehicles and engines. This product provides service to a wide range of batteries in everyday vehicles. It is definitely the best jump starter for people that travel a lot. Aside from that, it’s built for everyone who loves the peace of mind of an instantly firing engine. JNC318 model offers you the legendary performance from jump-n-carry. As well as, it offers unmatched reliability in a portable lithium unit. Weighs at only three pounds and can jump start up to eight-cylinder engines. It has full-size smart clamps for easy and safe jump starting. 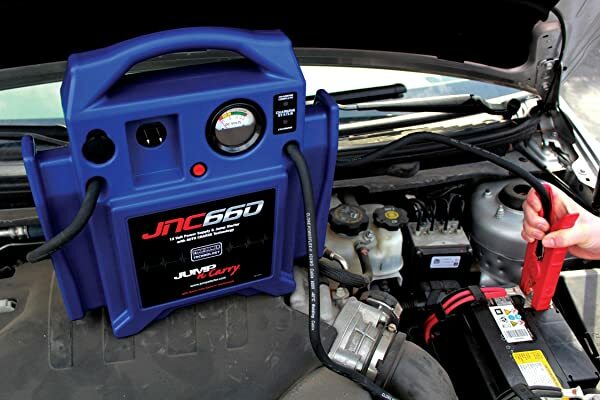 Offers a 12V jumpstart for engines ranging from eight cylinders and below. Portable, light-weight and reliable hand-held unit. Just by a simple flip of a switch, you wait for the LED to turn green and you are ready to jump-start. Preheat mode — This unique feature offers to jump-start your battery at extremely low temperatures. Portable storage casing — Come with a portable casing to store and carry all your accessories. Extra bright LED flashlight — It comes with an extra bright flashlight. It is also capable of strobe light modes for assisting with emergencies on the road in the dark. 2way USB power bank — Allows you to charge personal gadgets like tablets and smartphones. It is suited for engines of up to 8 cylinders. Its pre-heat mode feature makes it the best jump starter for outdoor activities with a harsh environment. This is an extra portable and light-weight design. It is a compact and long-lasting lithium-ion-powered jump starter built for 12V batteries. Therefore, the device can jump start up to 20 times using the power of a single charge. Besides, its spark-proof technology makes it possible and safe for anybody to use it easily. Also, comes with protection from reverse polarity. NOCO GB40 model is compatible with gas engines of up to 6,000cc and diesel engines of up to 3,000cc. On a single charge, it offers up to 20 jump-starts. Safety design with spark-proof technology and protection from reverse polarity. Compatible with gas engines of 6,000cc and diesel engines 3,000cc. Extremely bright LED flashlight — In case you need light to alert other motorists of an emergency, this device has got you covered. Optimum jump starting power — Its joule 3S’ labeling means the meaning the amount of power delivered in 3 seconds. Offers spare power — With up to 20 jump starts per charge, it means there is some spare power each time you jump-start. USB device recharge — It contains in and out ports to charge almost all USB compatible devices. The IN port allows the device to be recharged from any USB powered port. This product is recommended for every household to assist in light household duties like phone charging in power outages. 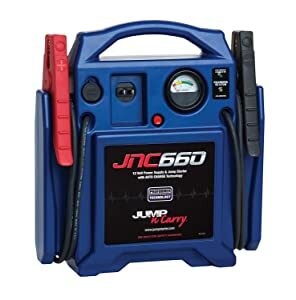 This is the best jump starter for small car vehicle owners in mind due to its power compatibility. This device comes with an instant starting power of 500 amps and peak amps of 1,000. With these specifications, you are assured of a portable and convenient way to jumpstart your batteries. All that is needed of you is to hook the clamps to your battery, put on the switch and then crank your engine. Features a reverse polarity alarm in case of an improper connection. Comes with a 270 degree rotating high powered LED light. Integrated 120-PSI compressor to inflate your tires. Built-in air compressor — This is a 120 PSI compressor, ideal for inflating your vehicle tires, sporting equipment or bicycle tires. 2Way USB charging — This enables charging of two devices at once, it comes with a 12V DC port. Bright swivel LED light — A swivel 270 degree LED light shines light wherever you need whenever your car battery goes dead. A DC plug — this plug enables you to charge your jump starter with the DC port in your vehicle. The feature ensures your device is charged and always ready when needed. This is a 120 PSI compressor, ideal for inflating your vehicle tires, sporting equipment or bicycle tires. This model is basically built for anyone who needs a portable, convenient power backup. 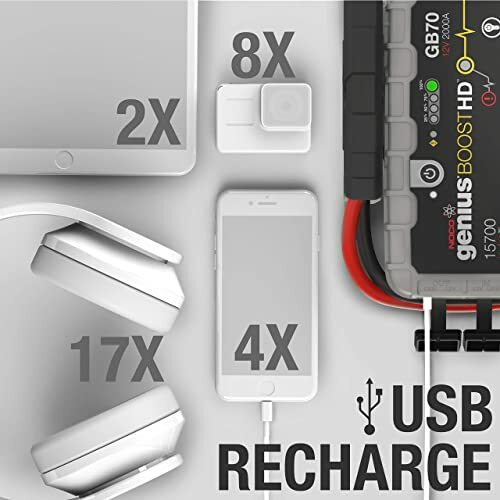 Whether in the case of power outages, low car batteries or charging your gadgets this device is definitely built for you. 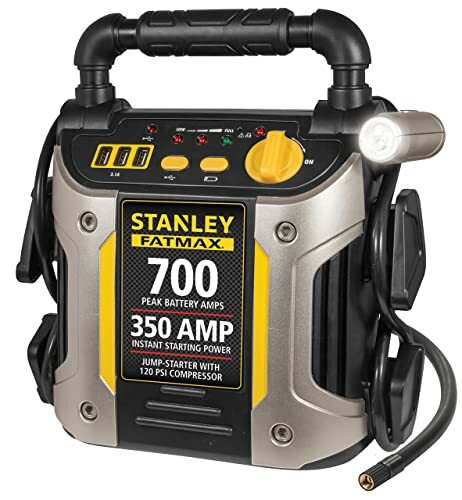 The STANLEY FATMAX J7CS offers a convenient and portable way to jump-start your battery without needing another car. 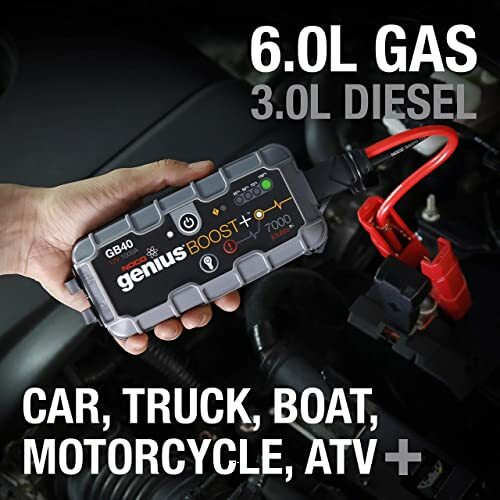 It offers you enough power to jump-start your car, tractor, boat and even motorcycle. Simple to operate as you just connect its clamps to your battery and start your engine. 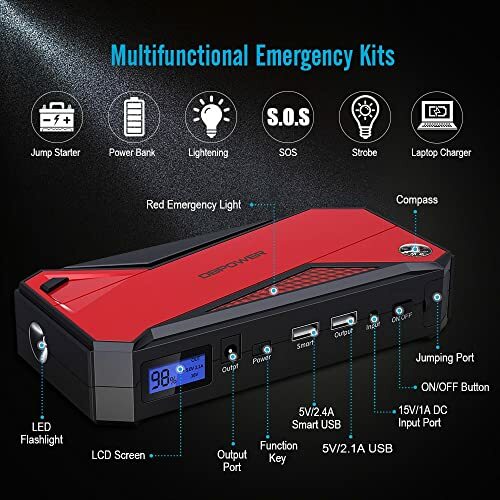 This best jump starter is suitable for roadside emergencies and daily use. You will simply attach the plugs to the car battery. If the plugs aren’t plugged correctly, an alarm will go off alerting you to fix the plugs correctly before turning the unit on. A built-in air compressor with a backlit gauge. Compatible with your truck, tractor, boat or even motorcycle. LED indicator and alarm for in case of reverse polarity. USB charging – This makes it possible to charge two devices simultaneously with the USB charger. LED light – This device can still be used in the dark. DC plug — An optional DC plug makes it possible to charge this best jump starter using your vehicle’s DC port. 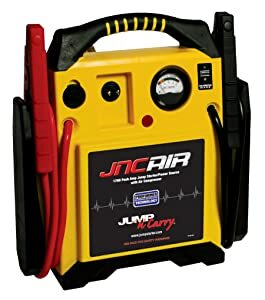 Air compressor — This best jump starter has an additional perfect fit nozzle which secures connections. Therefore, this makes it possible to inflate basically anything that needs pumping up like bicycle tires, sports equipment or even car tires. The bright LED light makes it possible to use this best jump starter even when it is dark. 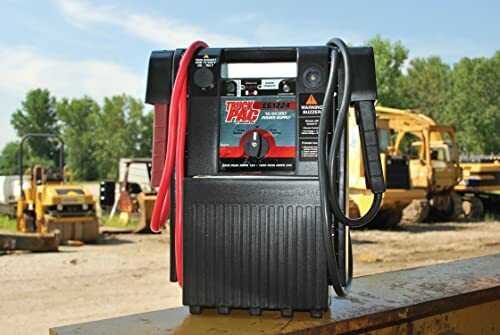 You can charge this best jump starter using the DC port of your vehicle. The product may stop working after a while. 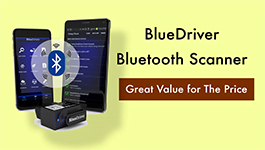 This product can be used by everyone who owns a car and can also be used at home. Campers can also use this device for lighting purposes and charging their mobile phones. This is the best jump starter which is a must-have for car owners. By use of a single charge, it will jump start engines with 6.5L gas engines and 5.2L diesel engines. It works best when fully charged. When it goes below 25% of the battery charge, it might not jumpstart your vehicle. Jump-starting vehicles which exceed the maximum displacement that the device can handle will damage this device. Compatible with gas engines up to 6,500cc or diesel engines up to 5,200cc. Very compact and portable to fit in your glove box. Features LCD screen to show remaining power and a compass for directions. It has a smart charger which is also portable — This can charge smartphones very fast. You can also use it to charge your laptop. The device is portable- It can fit easily in a glove box or your bag and can be carried around easily. Smart jumper cables — This protects your jump starter from over-heating, short circuits, and over-voltages. Bright LED light and emergency light — You can use this device even when it is dark. Apart from that, you can use it as a hazard indicator in case of a road accident or breakdown. It can also be used for calling emergency services. This is a very powerful device, using a single charge this device can jump-start vehicles over 20 times. You can also use this device as a power bank and charge your phone for weeks using this best jump starter. Portable and has a hard outer covering protecting this device from falls. These devices’ clamps tend to break easily. This best jump starter can be used by, basically, anyone. It is compact in size and portable making it ideal for carrying around wherever you are going. Besides, it is a fast charger and can be used as back up to charge mobile phones, tablets, and laptops for weeks. Jump starters are a must have for our daily use. Owning the jump starter can make a huge difference in our lives. In case of breakdowns, you can use them to jump-start your vehicle. Most of these devices can also be used to charge other devices and can come in handy in case of power blackouts. 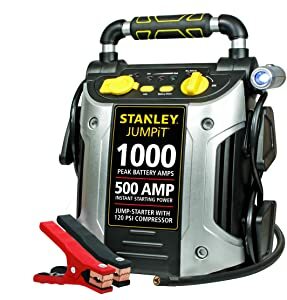 For maximum functionality ensure that the jump starter is always fully charged. Make a note of always carrying the best jump starter with you always.